For example, we could look at the tendencies of teams to do all their defending on the wings vs in the middle of the field. The below graphs show the one-dimensional left-to-right location (left sideline to right sideline) of every defensive action so far in 2017, separated by team. Basically, imagine that you’re the goal keeper, and you’re simply counting how often you see one of your players attempt a tackle, block, interception or challenge. Some interesting trends can be noted. Houston and Vancouver, for example, defend pretty evenly from left to right on the field. Orlando and Seattle on the other hand are really heavy on the wings. Minnesota, Chicago and San Jose are pretty asymmetrical. From this angle, the patterns aren’t quite as clear because the field is longer than it is wide. But still, some interesting patterns emerge. Minnesota has done a lot of defending basically everywhere behind their attacking third, while Montreal, a known counter-attacking team, contains most of their defensive actions to their own half. It’s also notable that, from this angle, some teams can be observed to do more defending than others in general. San Jose has some really high peaks, while LA and Vancouver are less so. Results are per 15 games because most teams have played 15 games so far this season. Welcome, friends, to the wide world of spatial statistics. My statistical colleagues will tell you that there’s a huge array of techniques for geospatial modeling, ranging from the obscenely-complex to, well, sort-of-complex. What they all have in common though is the ability to pick up on the patterns I pointed out with the first two graphs, but do it in both dimensions (or more) simultaneously. [†] Note: this formula is massively simplified for readability. All permutations of interactions are included, totaling 704 coefficients once team fixed effects are factored out. The point is that it’s a count model, where x and y (the horizontal and vertical position on the field from the sideline) are the main predictors of the number of defensive actions in a particular place. There’s also a bunch of square and cubed terms in there to make it smooth and curvy in 2D space. 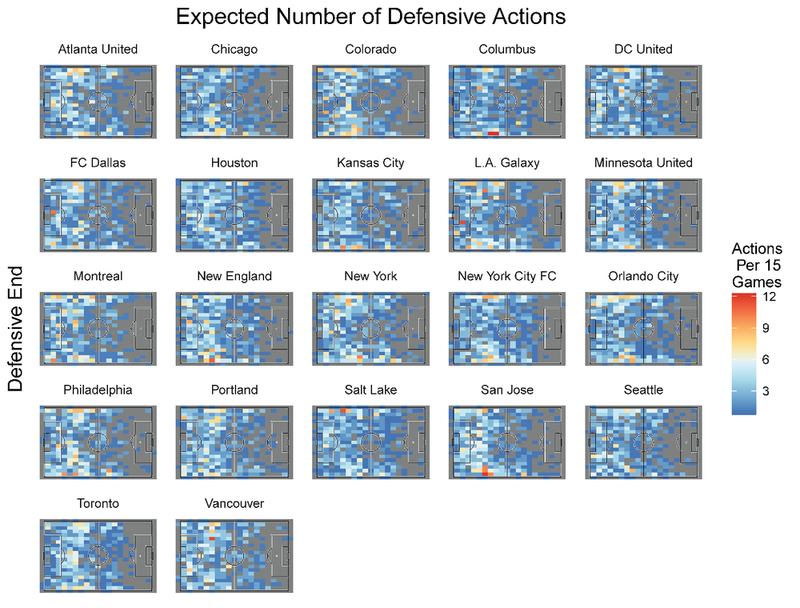 These are heatmaps of where, on average, each team ends up doing their defensive work. Red is lots of action, blue is very little. From these, you can clearly see differences in team styles. Orlando plays high on the wings, Toronto absorbs but doesn't fall too far back, and simultaneously creates a lot of action right on top of the opposing central defenders, Montreal bunkers deep in their own end, Seattle relies on the range of Joevin Jones, San Jose’s Nick Lima-Victor Bernardez-Florian Jungworth combination is lights-out, but basically all they've got. The complexities of spatial analysis highlight that there’s more to it than just high-press, bunker, etc. There’s asymmetry, playing to the strengths of your best players and islands of action in the middle of otherwise cold areas. You can see that the 2016 Montreal Impact created a lot more chaos in front of the box than the 2017 Impact do. Either they’ve become more clinical, or less goal-dangerous. Perhaps a similar analysis on passes and shots would shed light on that question. New England last year also employed a higher line of confrontation than they do this year. If one simply watched the games without looking at the data, these kinds of differences might actually go unnoticed. There are other potential applications for these kinds of results too. There’s so much detail in these heatmaps, that you might imagine analyzing how a particular team performs against a type of team with a very different style. Perhaps there are patterns within matchups that seem like unpredictable wins and losses when they pan out in real life, but would have been entirely predictable if the coaches (or betting lines!) had looked carefully at the history of one style vs another. We might also imagine examining these maps with and without a key player, to see how someone’s presence and absence impacts a team (like a more advanced version of this analysis I did a little while back). Or perhaps we could identify a turning point in a coach’s tactics, and use these to assess what it led to. We could even make player-specific maps and repeat any of the above potential analyses. There are, of course limitations to this. For one, it requires a huge amount of data to be able to pick up a reliable signal. Trying to estimate these heatmaps from one game to the next, useful as that would be, is kind of infeasible. These maps also don’t say anything about uncertainty. For some teams, the predicted heatmap might be a highly-accurate representation of their style, but for others, it might just be the midpoint of very blurry patterns. In that sense, they give the reader a false sense of certainty about team style. There’s also a multitude of statistical flaws (or at least weaknesses) to the model I’ve chosen. The most important consequence I've noticed is that this model tends to exaggerate when there are "islands" of action (like the Jozy Altidore/Sebastian Giovinco island for Toronto, or a number of the teams with hot spots around the corner flags). Those teams really do have tendencies to defend in those areas, but the heatmaps are way too dark there to be realistic. A better model, something like integrated, nested Laplace approximation, would probably avoid those exaggerations, but it’s kind of overkill for the first analysis of this kind. Finally, there’s the matter of whether the defensive action was actually successful. The maps above just show where attempts are made, but I could make completely separate maps (and I actually have already) about the probability of an attempt leading to a turn-over. Those maps tell a different side of the story that I may save for another article. Whether it’s used to predict the results of future games, analyze the impact of a major change, or just summarize a team’s style at a glance, spatial analysis like this is a natural fit for a fluid, tactical game. Really, I think the potential analytical uses for this kind of analysis are enormous. They’re also just kind of mesmerizing.